The Juno® SC handheld is a durable, lightweight field computer that integrates an array of powerful features. Providing photo capture, cellular data transmission, and high yield GPS receiver with 2 to 5 meter positioning accuracy in real time or 1 to 3 meter postprocessed, the Juno SC is an affordable solution that will increase the productivity of your entire mobile workforce. The integrated 3.5G HSDPA cellular modem provides high-speed internet connectivity worldwide. Your entire field workforce will be able to quickly and reliably access the data they need in the field—work-orders, map data, reference files, emails, and even the Internet. The Juno SC handheld also enables connections to networks and other devices with its integrated Bluetooth® and Wi-Fi wireless technology capabilities. The integrated 3 megapixel digital camera allows you to capture high quality images ideal for GIS data collection. Workers can accurately record asset conditions, provide documentary evidence, and give staff back in the office an accurate picture of the situation in the field. In applications such as natural resource data collection, public works asset inspection, and mobile workforce management where high productivity is critical, the Juno SC handheld is ideal. Incorporating a high-sensitivity GPS receiver, it has been specifically designed to maximize yield of positions in hostile environments such as under forest canopy and up against buildings. For these types of applications, the Juno SC handheld can be used in real time with its integrated SBAS receiver to achieve 2 to 5 meter positional accuracy. When higher accuracy is required to meet company or regulatory standards, the field data collected with the Juno SC handheld can be postprocessed with the new Trimble® DeltaPhase™ technology to achieve 1 to 3 meter accuracy. The long life battery of the Juno SC handheld allows GPS data collection for a full working day, without the need for recharging. The battery is also field-replaceable, for extended periods away from a power source. 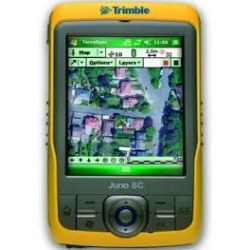 As part of the Trimble family of GPS solutions, the Juno SC handheld is fully compatible with Trimble's entire range of Mapping & GIS software, giving you a choice of GIS data collection and maintenance software solutions at a range of price points. 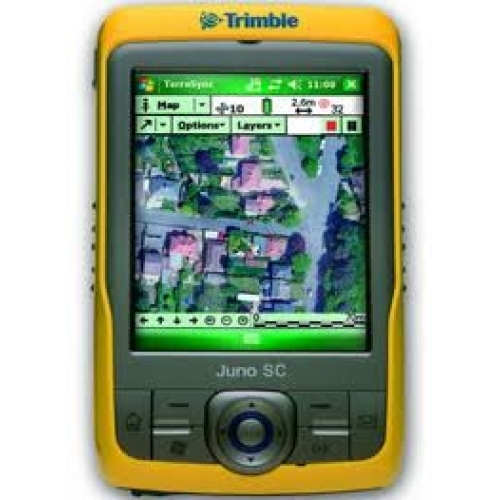 You can easily deploy the Juno SC handheld alongside your current Trimble equipment, and maintain the same workflows and policies. The Juno SC handheld is the complete toolkit for your entire field workforce.